More and more businesses are realising the benefits of Power over Ethernet (PoE). Supplying both power and data over a single cable, it means powered devices can be installed virtually anywhere – with reduced installation costs, and improved energy management to boot. But if you’re looking to offer your customers the flexibility of Power over Ethernet (PoE), there are a number of things you should look for. 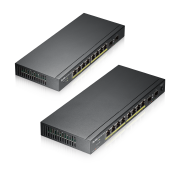 Are your switches scalable? Do they facilitate faster network speeds? Are you able to meet your customers’ needs today and tomorrow? With ZyXEL PoE switches, you can support the scalable implementation of devices – such as wireless APs, IP phones, IP cameras and more – to give your customers total control of their network. Furthermore, all ZyXEL switches support PoE+, the highest standard of PoE – for applications with a high power demand, including wireless IP surveillance and VoIP. Our latest PoE switches feature eight PoE+ ports and an additional two fibre ports for connections over longer distances – giving you greater flexibility when installing in your customers’ businesses. Requiring no additional training to install and use, our new PoE+ switches complement the existing range of 8- to 48-port PoE switches already available.